The autism spectrum hypothesis states that not only diagnosed individuals but also individuals from the general population exhibit a certain amount of autistic traits. While this idea is supported by neuroimaging studies, there have been few electrophysiological studies. In particular, there have been no spontaneous resting-state studies yet. In order to examine the autism spectrum hypothesis, the present study tried to predict the level of autistic traits typically developing young adults (n = 93) exhibit from spontaneous resting-state gamma power, a measure that has been linked to social functioning impairments seen in autism. The influence of age and gender was controlled for by employing regression. 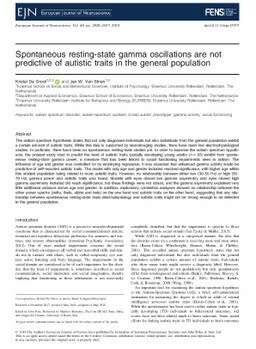 It was expected that enhanced gamma activity would be predictive of self-reported autistic traits. The model with only age and gender included reached significance, with higher age within this student population being related to more autistic traits. However, no relationship between either low (30–50 Hz) or high (50–70 Hz) gamma power and autistic traits was found. Models with eyes closed low gamma asymmetry and eyes closed high gamma asymmetry included did reach significance, but these findings were not robust, and the gamma asymmetry explained very little additional variance above age and gender. In addition, exploratory correlation analyses showed no relationship between the other power spectra (delta, theta, alpha and beta) on the one hand and autistic traits on the other hand, suggesting that any relationship between spontaneous resting-state brain electrophysiology and autistic traits might not be strong enough to be detected in the general population.